Many seniors and the children of seniors are faced with the hard and emotional decision of needing help for themselves or their parents. Here are some thoughts. In all cases get independent trusted advice before you make this very important choice. Keep in mind that many sales orientated people have now become involved in placements( placing seniors into assisted living) with fees being paid to them by the Assisted Living residence in the thousands! They will tell you that this is free to you. Nothing is free. These fees are rolled into your rent or lease. Home care is usually provided by agencies from mom & pop or caregiver owned, professionally owned and operated agencies to large franchises where owners come from many backgrounds and in some cases, are more marketing based than care based. Although many franchises are professionally run and do have owners that want to put care above huge profits. However, It’s the whole selection process as to who gets a franchise that may be faulty in assuring quality care agencies. But more on that in a later article. You want to be careful with real small agencies as they may only work in a small area and not use w-2 employees, carrying insurance or workers comp on their caregivers. 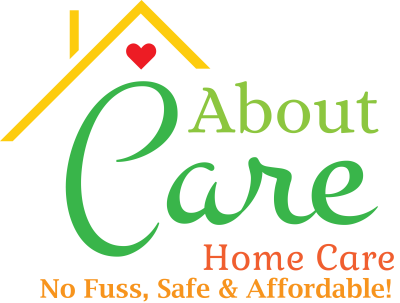 Be assured at About Care Home Care all our caregivers are our employees, well screened, insured and covered by workers comp. In general, Home Care provides one on one care you schedule into your home. You get to review the type of caregiver you would like. Your caregiver can help you with meal preparation, laundry, light housekeeping, transportation to doctors and shopping or even a movie. But it can go beyond just day to day help. It can also be personal care in which I discuss later. They can be there for 1 hour or 24 hours and up to 7 days a week depending on your needs and of course what your budget allows. You may wonder what is personal care? Personal care is generally non-medical care above general housekeeping, cooking or transportation. It includes showers, helps with toileting or changing adult diapers and/or bedding as needed. It's helping clients to stand and ensure no falls by constantly assessing that possibility and acting accordingly. This may mean watching their clients so they won’t fall, to using a gate belt or other method to help clients walk. It can be ensuring oxygen tubes are flowing freely to peg tube feedings and colostomy bag changes. It’s essentially helping to ensure the quality of life is as high as it can be for the caregiver’s clients. But personal care can be different for those in assisted living to those receiving home care. When receiving personal care in your own home you have a dedicated caregiver there to help just you. Within an assisted living that same caregiver may have from 4 to 13 different clients to help each day. But you may be paying the same or more hourly rate! It’s not a matter of dedication but is the span of control of juggling several clients and giving the correct amount of attention when needed. Very difficult when being pulled from over 10 clients/patients at once! Now Home Care or Independent/Assisted living is all paid through private funds. There is some help from the Veterans Administration but there are strict income restrictions. You will hear companies proposing reverse mortgages or even selling your life insurance policy. However, these should be looked at very carefully within a review of anyone’s net worth and future needs. It’s really a matter of preference. Assisted Living can appear less expensive until you are inside and need additional care. The costs can go up tremendously. But for those who like social living Assisted Living is certainly a good option. With home care, you will be comfortable in your own home, can pick your favorite caregiver and receive one-on-one care! You can choose just 4 hours a day for 3 days a week and much of your or your loved one’s daily needs can be taken care of. They or you would be safer and remain comfortably in your own home! All for less than the cost of Assisted Living! In fact, unless you need a lot more than 20 hours a week, we are positive that we can beat the pricing of most decent group home/Assisted Living and you can remain in your own home!. Assisted Living in Arizona can range from small private houses for 2 to 6 people up to huge complexes that serve hundreds. Often seniors will move into Independent Living first. This is much like living in an apartment but with communal meals and possibly some security/safety checks. This does ensure a greater level of safety because nutrition will be assured and someone will be monitoring for safety at least occasionally. Cost for this can vary from $2500 a month to $6000 or more depending on luxuries or amenities provided. For those that are social and can adapt well to living with large groups of people, there are many benefits to this type of living arrangement. But as seniors age, they will need more and more personal care. This type of care is always extra and is often more than what a private agency will charge. Many residents will not ask for outside services and end up paying for the high-cost in-house services. Note: Many Independent livings facilities will allow private agencies into service their residents. You should ask other residents about this policy prior to signing up. About Care Home Care does not do placements. We are totally dedicated to providing in-home care. Placements are fine and we understand that some seniors want to live in an assisted living residence, but we find that due to the LARGE SUMS(Thousands of dollars) being exchanged by those involved that we do not do placements for our profit. These large sums(usually the first months total billing are rolled into your lease or rent and paid back over the time you reside or for a fixed period. This large fee paid for placements places a lot of pressure on referral sources, families and potential residents to be put into Assisted Living. This lessens our (potential) clients ability to stay in their own homes which is one of the primary reason we are in business. With the large volume of new construction of assisted living locations in the valley, this pressure is only going to get stronger in the next few years! If requested, we are happy to make recommendations when needed, free of compensation, to those assisted living locations or Placement Agencies that we know have good reputations from our years of experience. Wonderful for those who enjoy a social and communal living experience. Can feel locked into higher charges including personal care that can be higher than an outside agency charge! Remain in your own home! Can be less expensive than Assisted Living. Recieve one on one help!